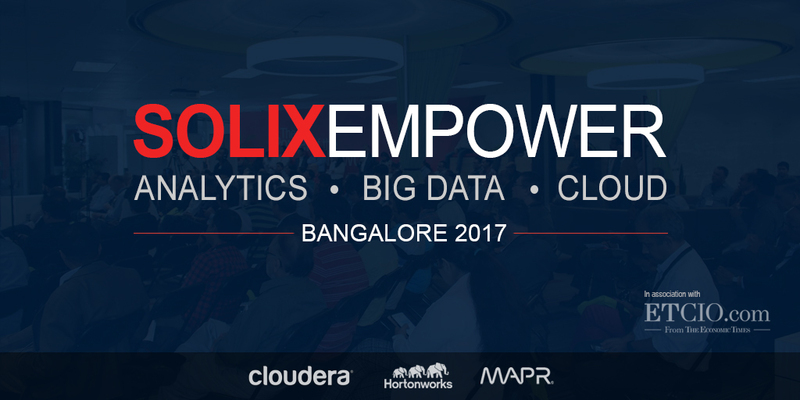 I am excited to announce Solix EMPOWER Bangalore 2017 on April 28 — the largest Big Data conference, the Asia Pacific region has ever seen. At Bangalore, Solix will further our mission of empowering enterprises to monetize data effectively, efficiently and safely to become truly data driven. Working in partnership with ETCIO.com — an initiative of The Economic Times — the Bangalore conference features an impressive array of demonstrations, trainings and speakers. At Solix EMPOWER we will delve into ABC (Analytics, Big Data and Cloud technologies) and offer access to the leading experts and vendors. Attendees will have access to three tracks: business, technology and training. We will also have a pavilion where partners and vendors will offer demonstrations on the latest Big Data technologies. As we prepare for the event, our speaker list and panels continue to grow. We have more than 20 panels on the business and technical tracks. Panels will include discussions on the data lake, data archiving, data security, machine learning, and cognitive computing. We will take deep dives into the worlds of banking and financial services and health care — industries where data has huge potential for both opportunities and disruption. Joining Solix will be some of the brightest minds from leading U.S. universities, including the UC Berkeley, UC Davis, and Northeastern University. Thanks to our partnership with ETCIO.com, the conference will be attended by more than 150 CXOs, offering unparalleled networking opportunities. We will also feature demonstrations and presentations on the Solix Big Data Suite and Solix Common Data Platform, which we believe is the foundation to enable a data driven Enterprise. Cloudera, Hortonworks, MapR and several other organizations will be participating in the training track, offering training on the latest Apache projects, analytics and more. Solix EMPOWER Bangalore is, simply, the best opportunity to train on the latest Apache projects. Solix EMPOWER San Jose 2016 was a wonderful success. With Solix EMPOWER Bangalore 2017, we are building on that success to deliver even more opportunities to transform enterprises into truly data driven organizations. This one-day conference is a cannot-miss event for organizations working with or interested in using Big Data technologies, located in APAC or ME region. To learn more and to register visit http://www.solixempower.com. Register early, as space will go quickly. Use code SOLIX50 to get a 50 percent discount on early registration. Group and student pricing is also available, as are a limited amount of FREE registrations, which give access to the pavilion and business track.